In June this year a scrambling pal, Barry Townend from Shrewsbury, suggested that I should join him and a lad called Paul in a three-man team to take part in the Chester Classic Club’s popular 100 Mile Team Scramble at a place called Ruabon near Wrexham in North Wales. He assured me the really well organised, laid-back event would be great fun and I would really enjoy myself. Being the joker he is, I’m sometimes inclined to take what Barry says with a pinch of salt, however, on this occasion he was absolutely right on all counts and the ‘100 miler’ proved to be one of the most enjoyable day’s scrambling I’ve ever experienced. The weather was good, the track well laid out, the organisation excellent and everybody was most welcoming. It was decided that the event should be open to riders of all abilities and on any twin-shock machine with drum brakes. 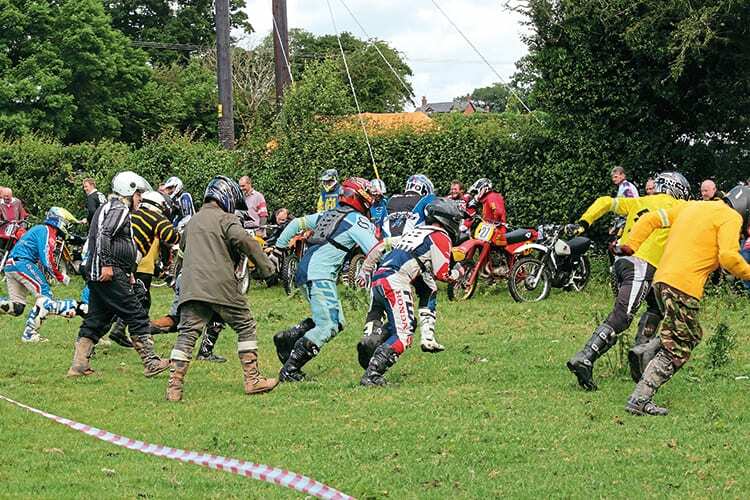 The entries quickly piled in and the Chester Club’s first ‘100 miler’ was launched with riders competing on motocrossers, enduro bikes and even trailies, all with the single aim of having fun. They obviously really enjoyed themselves because long before the end of the season they were asking about regs for next year’s ‘100 miler’! So in June this year, 21 teams of three riders entered the event, many with quirky and amusing names such as Team Big Dinner, Bingo Wings and We am Yam Yams. Our revered team manager and supremo Barry quick-wittedly decided that since I am Scottish and would be journeying south of the border to the event then our team should be called ’North of the Border’. Who could argue with such original thinking? On arrival at the track on the Saturday, my wife Jean and myself were greeted by Barry who cordially offered us some welcome liquid refreshment. He then rather sheepishly informed me that due to unforeseen circumstances his mate Paul had to withdraw from our team. “Oh what a shame,” says I, “Who’s going to replace him?” Even more sheepishly Barry mumbled a reply. “Er, well….nobody.”. We were now a team of two. The rules of the event are quite simple. The first team to complete 100 laps of the mile-long course is declared the winner and the event is ended. Before the start, team tactics are cunningly devised and decisions made on how many laps each rider would do before handing over to reinforcements. Being reduced to just the two of us, simple arithmetic told me Barry and I would have to complete a mere 50 laps each. A doddle! Barry reckoned I should hit the track first on my wee Honda Elsinore, make some ground and after half an hour I would be called into the pit lane by our doughty lap-scorer/timekeeper Jean and he would take over on his thundering 600cc Husky/Yam. Excellent, sorted. After a massed ‘sighting-lap’ we were soon back at the start area and ready for the race. A Le Mans type start was the order of the day, so with Barry holding my bike (he thought I’d enjoy the sprint), we lined up 10 yards opposite our trusty steeds and waited for the off. When the flag dropped, with steamed-up goggles I belted across the track in the vague direction of Barry and my bike. Having found the bike it fired up first kick and I was off. With goggles clearing I soon got a rhythm going and began to enjoy the flowing nature of the track. There were bikes all around and plenty folk to dice with. It was great fun. Before I knew it, Jean was signalling me into the pit lane to hand over the baton to Barry who was apparently champing at the bit to join the fray. Only snag was he’d flooded the big thumper and couldn’t get it to ‘light-up’. I was hurriedly ushered back onto the track whilst Barry went off to look for a new spark plug. Two laps later I was reeled in, handed the team arm-band to Barry and he took off like a scalded cat showering everyone in the pit lane with muck and stones. Barry proceeded to put in some quick laps and soon his half hour was up and suitably refreshed I joined in once again. Our tactics seemed to work, team spirit was excellent and before we knew it a great day’s scrambling was at an end. Team Trauma had taken the chequered flag closely followed by the Ginger Nuts on 98 laps and team Tigger in third place on 97. A close-run thing indeed. Barry and I didn’t exactly set the heather on fire but we didn’t disgrace ourselves either. Given that we were reduced to only two, our 84 laps completed was respectable enough but more importantly we had enjoyed a fantastic day of pure fun and excitement. Huge thanks are due to the Chester Classic Club and all the hard working members who give up their time to make such enjoyable events possible. laps were accurately recorded. What’s more they managed to keep smiling which was encouraging for us as we began to flag a bit. Finally, we shouldn’t forget ace photographer Phil ‘the photos’ Jones, who was there recording our antics and providing superb visual memories of a great day out. If you’ve never considered riding a ‘100 miler’ then I can only say go for it. It was brilliant and I will be back. A Le Mans start, some reckon that’s the hardest bit.